Cant see it? Give us a call on 0800 321 3357 or email. 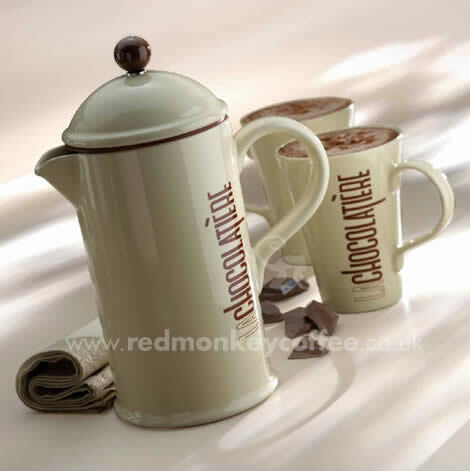 Prices include FREE UK Delivery by Royal Mail / Courier. Orders are normally dispatched within 1-2 working days. 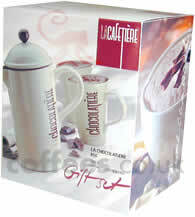 Gift set comes in designer presentation packaging as shown to the left, the set contains: 1 La Chocolatiere 1Litre Pot and 2 La Chocolatiere Mugs. These items sold seperatley would cost more! on top of that 'saving' you are getting lovely Gift packaging!